What’s Your Favorite Blog Post? After writing a blog for a while, it’s natural to go back and reread old posts. Some are so embarrassingly bad (from the author’s point of view) that it’s tempting to delete them. I rarely do that because bad writing is part of the process, and it’s important to see how writing style and quality progress over time. This blog post is my favorite! It isn’t my best or most well-written post. It’s not my most popular. Nobody has read this post in months, but it’s still my favorite. When I read it, I always find some words and phrases that I want to change, but I don’t mess with it. I think it catches the feeling and tone of that particular moment, and it makes my point. What’s your favorite post or article on your own blog? Post it in the comments below and explain why it’s your favorite. I enjoyed this post!! Time to read your favorite post. Thanks! You have a lot of great poetry on your blog. Aw thank you!!! Why don’t you think you can write poetry? The one I posted today because it is a kind of revelation even to me. I didn’t know the term exists and the article explains a lot, answered questions I’ve been asking myself for the longest of time about myself too. That was fun, looking at all the characteristics and applying them to myself. I don’t think the term applies to me, but I know a couple people who might qualify.. There are always exceptions to the rules. I don’t think I could pick just one. Every so often though I will see people have hit old posts and I click on them just to reread. I often make myself laugh. As long as I keep doing that, I’ll keep writing. I only have three posts up so far, so I don’t really have a favorite yet. It would have been a tough choice anyway. I like icing, and I like mystery novels, so I’m not sure which of yours to choose either. Since a lot of my posts relate to specific story in the news, a lot of them lose relevance, so there’s really only a few posts I could pick from. You have a lot of awesome stuff on your blog, so I was wondering how you would pick one post from everything you’ve written. That was a great choice! I agree that when you look back at what you’ve written, more often than not, it’s embarrassing. Although this may happen not just due to bad writing, I think it also happens because along the years, you change as a person. You get newer and wider perspectives. You grow out of certain beliefs and preconceived notions. I think being embarrassed by the things you write in the past is a good sign at times. It shows that you’ve matured as an individual. Although this isn’t read by a single soul, it’s my favourite because I believe that I have written it very honestly. This was my opening blog post and at the end of writing it, I realised I was being truthful to myself and that kept me going for the rest of the blog. Ha! I don’t remember if anybody read my first post either. Your first post was much much better than mine. I also thought your “Dilemma of a Modern Writer” was pretty good. That was great! I also liked the one about the fossil (Oscar?). What a great idea! 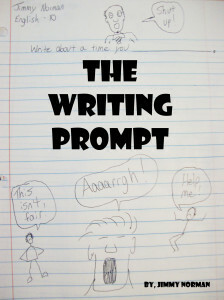 I’m a big fan of Stephen King too BTW, so your Writing Prompts is probably awesome. 2,000+ miles? Are you kidding me? I just stared at the map in awe for a few minutes before I read the the rest of your post. I was never one of those journalists who could go back and read my articles once they went to press. I am with Ocean Bream. I post and move on. I am about to read yours as well. Thanks for your blog! I don’t travel much, but you have some good tips (and I might be able to travel more in a few years). I also liked your Texas and New Orleans lists. Thank you for posting! Great stuff! I still giggle at “My Thoughts on Uranus”, something short I wrote over two years ago. Why? It’s short, funny, and came at a time when i was trying to figure out what to do with my blog: how do I keep ‘blogging’ during the time it took to read another novel and write a review. Much as I love that cornerstone of Books and News, it’s the humorous banter that keeps me entertained. Ha! Uranus never gets old. And I agree that it’s tough to write only about books and news about books. The major sites that do that have to rely on reporting famous author tweets. At least you’ve found a more creative way to keep things interesting all the time. This is such a fun idea! I’m enjoying clicking through everyone’s favorite posts. I usually like my humorous posts the best, but my favorite post is a serious, creative piece on growing up Mexican American. I like how I captured so much of my frustrations in a simple, short post. I also like how I played around with space and formatting. Really though, I still love those last few lines, which came to me before I wrote anything down at all. Aren’t those the best? I also really liked the posts about your high school scandal and reading the news in 2017.